Ölüdeniz is one of the most beautiful beaches in the world. It is confronted with many prestigious journals or lists around the world. Ölüdeniz, known as the "Light and the Sun" in ancient times, is a place where you will enjoy the sea and the sun all day with its turquoise and blue color and its delicate sand. This beautiful blue-flagged place is connected to Ölüdeniz municipality, 13 km away from the center of Fethiye. You can come here with the minibuses departing from the center. Ölüdeniz entrance fee 7 TL, student 3,5 TL. Oludeniz Kumburnu Nature Park is registered as a motorcycle at the price of 7 TL per person, you can enter the entry price of 25 TL for the car. The backyard lagoon is shallow even if you are even a few feet down, and it is also a great place for children and families who do not swim. Sunbeds and umbrellas can be rented at Blue Lagoon in Oludeniz, as well as cafeterias and buffets for eating and drinking. Belceğiz Beach, the sea of blue, is one of the most popular beaches of Fethiye with its crystal clear sea in crystal clear water. There are lots of boutique hotels, pensions, aparts, cafes and restaurants in Fethiye's Oludeniz neighborhood. This is a perfect vacation spot by itself. The enthusiast enjoys sunbathing accompanied by water sports. The hiking trail immediately behind it is used as a paragliding track. Plaja stretches parallel to the cafe, restaurants are among the best places in Fethiye. It's a place where you can eat, rest, and enjoy the sea in the daytime. Well, I recommend Cafe. The Valley of Butterflies which embellishes the skirts of Babadağ, the famous mountain with endemic plants of the Mediterranean Region, is one of the most beautiful natural beauty of our country. Due to its natural beauties, the valley which was declared as a natural site in first degree in 1995 is one of the most important addresses of nature and camping tourism in our country. He's got more of a butterfly species than the one he's got in his name. But when you go, do not expect butterflies flying everywhere, you can see the river and the waterfalls deep in the valley. Ideal for entering the sea, camping. 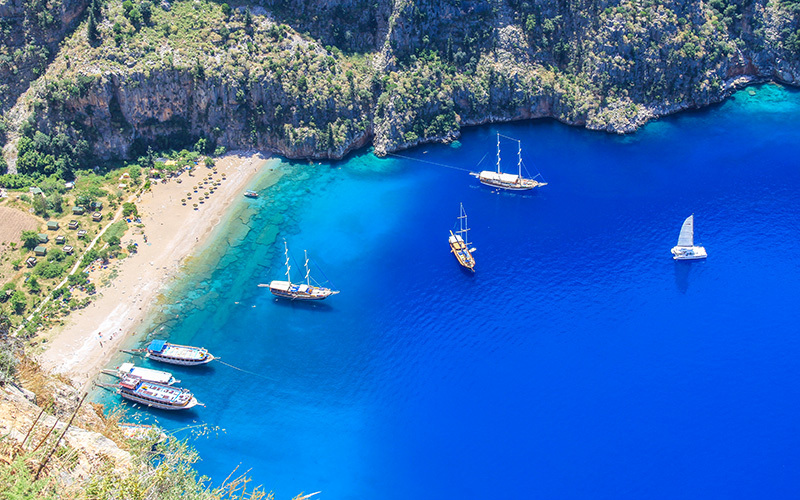 The boats from Oludeniz can be reached. It can also be descended from a slightly tough path by Farala. I remind you that the patrician is not suitable for everyone. Do not forget to photograph the glorious view from the hill where the sign is strayed to the Lycian Way Karaöz road. One of the unique natural beauties of Fethiye, Kabak Cove is the place where our country is the brightest star among young people in recent years. It is almost a paradise with a bay that stretches for 200 meters. The bay, approximately 17 km from Ölüdeniz to Fethiye, consists of a deep valley in the form of a canyon surrounded by mountains on the three sides and a sandy beach to the sea. On the first level, koya is a protected area. You also have to go by car from land to a certain point and then walk afterwards. There are many hotels, cafes and restaurants in Kabak Bay, which young people who prefer to have fun prefer. It is a wonderful place to choose as a hostel. Kayaköy, a neighborhood of Fethiye, is an old Greek village. Kayaköy, formerly known as Levissi, was a lively area of about 10 people living in 1923. The village, built on Karmilassos Antique Keti, a few kilometers from Hisaronu, was built on the slope of a hill. Kayaköy between Fethiye sightseeing places was vacant for many years after being abandoned by exchange. Kayaköy is now reviving with its narrow streets stretching from pine, pomegranate and fig trees to houses, churches, chapels and extraordinary scenery. With time, boutique hotels, workshops and places will surely be one of the prominent places of our country. 7. Lycian Way Gemile Island is one of the most important natural sites in our country with Gemiler Bay and Gemiler Valley in front of the island. This is the second largest and most beautiful bay in the region after Ölüdeniz Bay. When you get there by Kayaköy you will have a wonderful view. 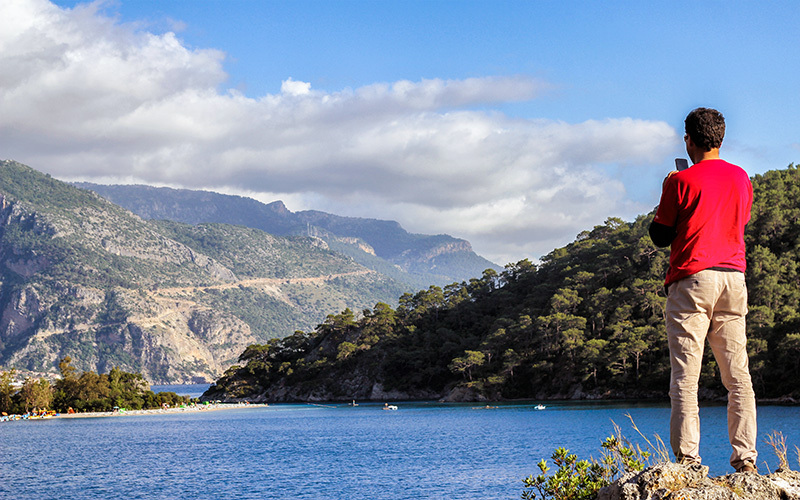 Gemiler Island, formerly known as Aya Nicola, is 9 km from Fethiye. Surrounded by beautiful beaches, olive and pine trees, the frescoes on the island are still intact, with Byzantine and Early Christianity Church remains visible. You can go down a fine road that goes through the forests of the Red Fox through Kayaköy road. The Lycian Way, which the Lycia used as a trade route in antiquity, is a world-famous trekking route that stretches between Antalya and Fethiye gulfs. 535 kilometers length Turkey's first long-distance hiking trail is the Lycian Way, showing a variety of sources, as one of the world's top 10 long-distance trails. The Lycian Way, which offers incredible beauty for nature lovers through untouched coves, mountains, desert villages, Idyros, Phaselis, Olympos, Limyra, Myra, Simena and many other ancient cities, is one of the rare routes where nature and archeology are blended. Do not forget to join one of the Lycian Way tours organized in the surroundings. Calis Beach, a quieter beach compared to other beaches in the region, is located 5 km from the center of Fethiye. This wide, sandy and easily accessible beach, miles of miles, clean sea and unique views of the Gulf of Fethiye are among the best beaches in Fethiye. At the same time, the beach, which is one of the caretta carettalar's habitats, also offers convenient facilities for water sports activities with its own facilities. Belcekız and other beaches and spots in the vicinity, I prefer to visit Fethiye's place even though it is a holiday. There are a variety of eating and drinking and entertainment venues, accommodation facilities, and just about everything that is needed around this beach. Quieter place than other crowded beaches. The Fethiye King Tombs near Fethiye district center are one of the most important symbols of the city which are neglected in the city. The Tombs of the Rock, which are the tombs carved into natural rock, are one of the rare artifacts that have survived from the Lycian period to this day. These tombs which can be reached by the steps, the view of judge in Fethiye and the sea view, the places to be seen with gothic architecture and admirable works. Fethiye places to add to your list. Fethiye Archeology Museum is one of the places to be seen in Fethiye, which is located in a rich region in the care of ancient cities. Located very close to the center, the museum has been in service since 1987. A large number of antique artifacts, sculptures, ceramics, glass and metal objects dating from the Ancient Age to the Byzantine period can be seen in the museum, where many works from the excavations and citizens were exhibited.